I'll always think of Ukraine as the heavy side of the world. Like the more-familiar Russian, the Ukrainian soul is characterized by "heaviness" in all the word's connotations: weighty, difficult, serious, massive, important, monumental, solemn, soul-wrenching. It's the most valued personal trait in poets, leaders and common people too: "deep-souledness." Living there for two years as a Peace Corps volunteer, I breathed it into me, this "heaviness." For me, it sums up how it feels to live in the former Soviet Union today. 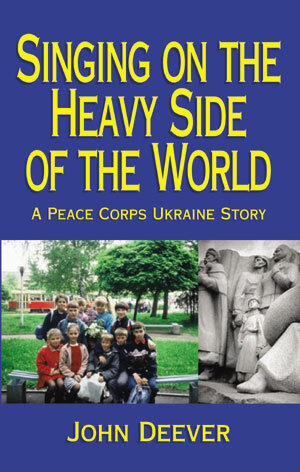 Even the word in Ukrainian for heavy—tyazhko—means both greatness of weight and difficulty or painfulness of burden. Ukrainians carry heavy bags and packages everywhere they go, and even the simplest task, from buying groceries to mailing a letter, is more difficult to do than in the United States. Life is difficult and heavy—tyazhko. Ukrainians often are heavy, for the diet is heavy. Staple vegetables are the eminently serious: potatoes, beets, and cabbage. The national dish is thick, doughy dumplings smothered in sour cream. An extra special breakfast might include fried pork cutlets, canned sardines on dark rye bread, and a bowl of large curds of cottage cheese sprinkled with sugar. Salo, a thick uncooked slice of bacon so fatty that no pink appears at all, is a Ukrainian delicacy. Look at work: Ukraine was home to 40 percent of the USSR's heavy industry. In a land known for record-setting massive machinery, the level of Ukraine's industrialization is second only to Russia's. Hence every Ukrainian suffers daily from heavy pollution. Heaviest of all is the weather. Even though it is far south of Moscow and dark northern Russia, in Ukraine the midwinter sun rises at nine and sets at three-thirty. On such short, dark, gloomy days I felt a heaviness of spirit so crushing that every step became an exhausting undertaking. I felt like an orchid in the Arctic, so out of my element I could not thrive. I was a lite potato chip in a ten-pound bag of Idahoes. Understanding this feeling, Ukrainians taught me about heavy drinking. Often, foreigners who have visited the USSR describe the relief they experience upon leaving. Why, as their airplanes leave Russian soil, do they so frequently emit long-suppressed sighs? I think those sighs are released once our inner sensors feel the scales tip back. Immediately, perceptibly, there is a lightness as we lift into the air and the sadder, heavier side of the world remains behind. I sometimes imagined a lopsided globe, with a bulbous, massy hump where the former Soviet Union is. Its mammoth scale of proportions, its overgenerous share of human suffering, and the bulky heaviness of the Slavic soul caused the globe I imagined to tilt perpetually sideways toward these people, this place, where some strong force of gravity held them in place. Economic and social conditions in Ukraine are famously, absurdly bad: what pensioners receive in monthly benefits was worth about the price of ten eggs; state salaries of teachers and many other workers went unpaid for eight months straight while I was there from 1993 to 1995. The rampant corruption, the frequent murders of public officials and journalists, the often unbelievable pollution, and the people's declining health standards—every day came more bad news. I wanted to think that conditions since communism's demise were gradually improving, but to say so seemed ridiculous. When I professed optimism, Ukrainians were pleased, but kindly dismissive; when I joked about either my life or theirs growing ever worse, they said: "Now you are coming to understand us." Living amongst these people, then, what I found—sunk like a rock at the bottom of the well—was not despair but a weird, black humor. Under the heavy burden of daily life lay rare gems of ironic, sad laughter. Many days when my lessons failed disastrously, when my days teaching in a Ukrainian school felt agonizingly pointless, I wanted to cry, give up, go home, forget it. Yet some strangely funny thing would convince me to stay, to try a little harder. Finally, when even humor would not suffice, there was singing—the pastime of which Ukrainians may be more proud than any other. Late winter evenings, walking the slushy streets of my city, I would first hear them, their voices faint as they approached, and then see them, no more than dark silhouettes under a flickering street lamp: clusters of people strolling arm-in-arm, returning home from some birthday party no doubt, and singing. In deeply beautiful minor-key melodies, whose harmonies merged and then parted in melancholy yet uplifting threads, Ukrainians kept on singing—sadly, resiliently, and with a depth of heart I longed to understand and share.